Palangan-im-mun-blos is the native name for this interesting game secured by Dr. Furness from the Natik woman "Emily." First and Second: The same as the First and Second movements of "Ten Men." Third: Put each thumb from below into both index loops, and draw the thumb toward you in order to make the loop wider. Turn the middle, ring and little fingers of each hand away from you down over both strings of the little finger loop, and then, keeping the strings taut, turn the hands with the palms facing each other and then facing upward, to bring these three fingers toward you and up through the two loops passing around the thumb and index. Let the far index strings slip over the knuckles of the middle, ring and little fingers to the back of the hand; straighten these fingers to release the little finger strings held under them, the loop itself, however, remaining on the little finger. Let the former index loops slip down on the wrists. 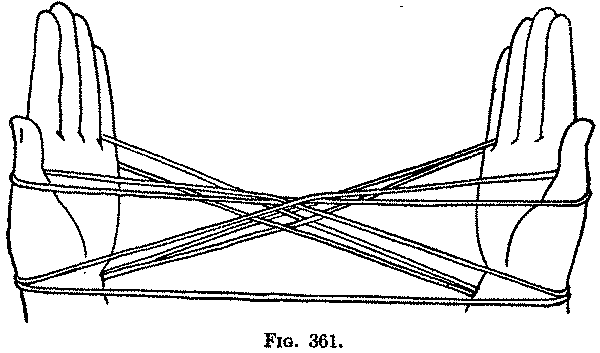 Draw the strings tight (Fig. 361). Fourth: Bend each index down into the little finger loop, and draw toward you the near little finger string, then still holding this string put the index down into the thumb loop (Fig. 362, Right hand), and pick up the far thumb string by turning the palm away from you and straightening the index (Fig. 362, Left hand). Separate the hands (Fig. 363). Fifth: Withdraw the thumbs from their loops, and transfer each index loop to the thumb by putting the thumb from below into it and withdrawing the index (Fig. 364). Sixth: With the thumb and index of the right hand take from the left hand the two loops passing around the left wrist, and put them again on the left hand in the First Position. With the thumb and index of the left hand take from the right hand the two loops passing around the right wrist, and put them again on the right hand in the First Position (Fig. 365). 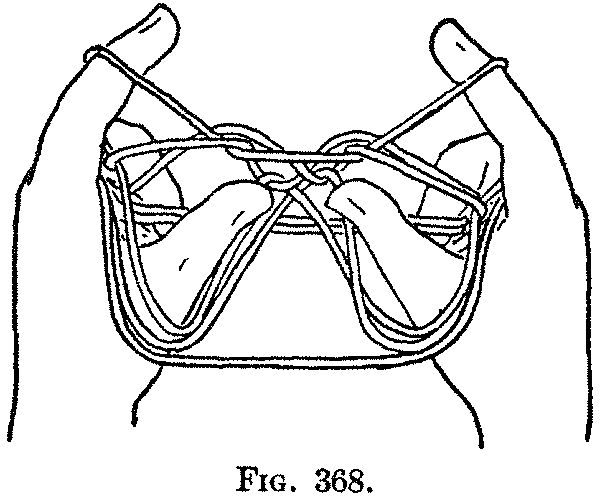 Seventh: Bend each index down into the little finger loop, and draw toward you the near little finger string (Fig. 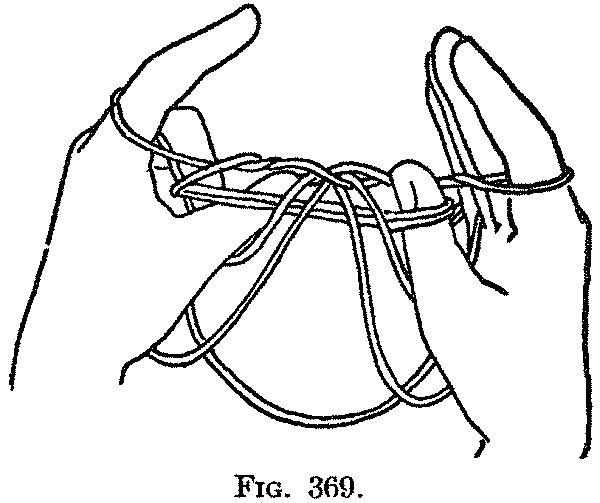 366), then, still holding this string, put the index down into the thumb loop (Fig. 367, Right hand), and pick up the far thumb string by turning the palm away from you and straightening the index (Fig. 367, Left hand), being careful to keep all the strings on the thumbs. 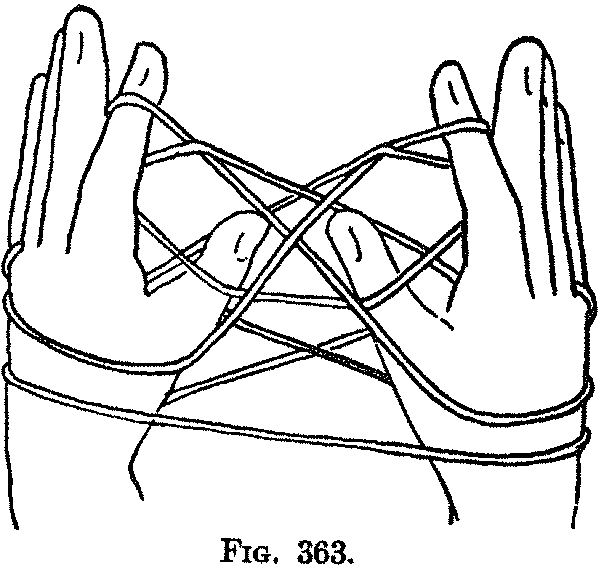 Eighth: Bend the middle, ring and little fingers of each hand down over all the far little finger strings, and bring the two far little finger strings that pass directly from hand to hand, forward, toward you, until they touch the rest of the figure held extended between the index fingers and the thumbs (Fig. 368). 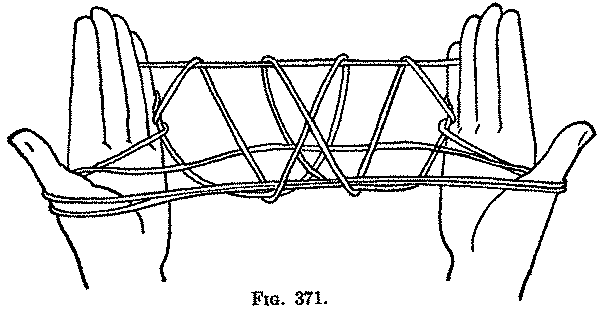 Ninth: Carefully withdraw each thumb from its loops, and insert it again into the loops, but from the near side and away from you, and pick up on the back of the thumb the two straight strings held toward you by the middle finger (Fig. 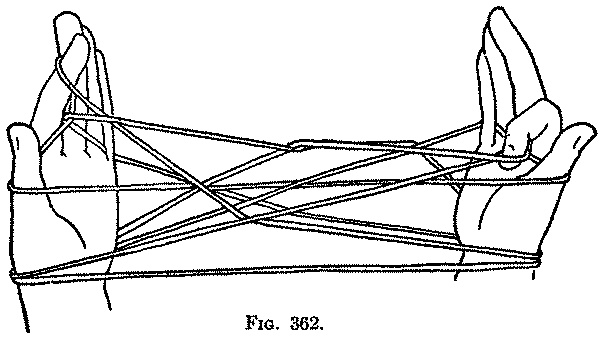 369, Left hand), and pull them down through the loops (Fig. 369, Right hand) by restoring the thumb to its original position (Fig. 370). Tenth: Remove all the loops from the little fingers. This can be readily done by pushing them off one little finger with the other little finger. 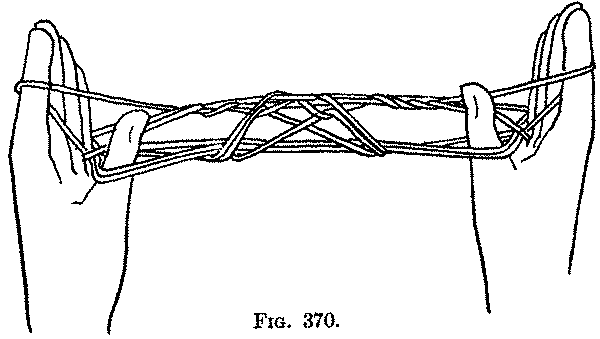 Eleventh: Transfer the index loops to the little fingers by picking up the near index string of one hand with the thumb and index of the other hand, and placing the loop on the little finger, so that, without any twisting, the near index string becomes the far little finger string of the same hand (Fig. 371). Twelfth: Find the far thumb string which passes directly from thumb to thumb (it often hangs down loosely), and pick it up on the tip of each index finger to form the ridge pole of the "house" (Fig. 372). The figure is extended between the thumbs and the index and little fingers, with the palms facing each other and the fingers directed upward. Just what a "blos-bird" is, I am unable to say, but it has a house and a very pretty one at that. The method of transferring the index loops to the wrists, observed in the Third movement, is peculiar to this figure; a single index loop is transferred in the same manner in the two figures which follow immediately. The Fourth movement is interesting because of its resemblance to the Torres Straits "King Fish," but in that figure the index is put first into the thumb loop and then into the little finger loop, and the movement is confined to the right hand. We shall see the Torres Straits movement done in the next figure, the "Three Stars," but done with both hands. The Eighth and Ninth movements are foreshadowed in the Sixth movement of the "Triangles." Of course, the Eleventh movement can be done by the little fingers; it requires some dexterity.